Playing Glacier View Golf Course is a unique experience and appeals to golfers in a variety of ways, said Andrew Lettrich, head professional and general manager. Glacier View Golf Course is located on the southern edge of the park in northwest Montana, and the scenery at this course truly is a sight to behold. You will witness a combination of both the natural beauty of the area as well as the immaculately-maintained fairways and greens of the course. Glacier View is a fantastic place to get the family together. Not only does it have excellent customer service, affordable rates and exceptional food and beverage services, but the course is also very sympathetic to players of all ages and skill levels. The club also plays host to a variety of special events throughout the year. Another big event for Glacier View is the Flathead International, a two-person scramble using the Stableford scoring system. Held on August 17, this tournament is one of the club’s most popular events. The course this year sports a new addition: another tee box on Hole 7. It adds 50 yards to the blue tee and certainly amps up the challenge for those who are ambitious enough to try it out. Five minutes west of Glacier National Park in West Glacier, Montana. Addition of tee box to Hole 7, increasing blue tee distance by 50 yards. 60, held by Steve Stephens and head pro Andrew Lettrich. 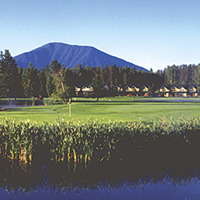 Senior Open July 13-14; Flathead International Scramble August 17; Night Golf on last Friday in June, July and August. 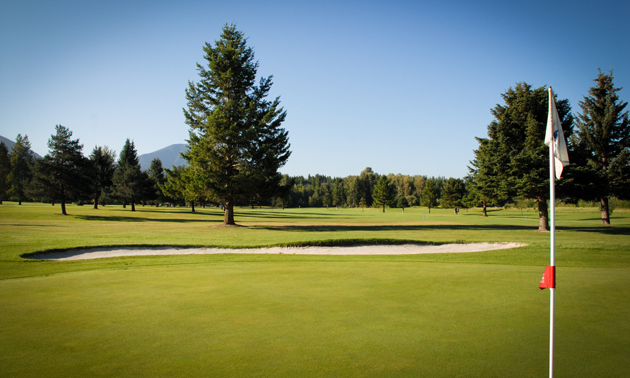 Weekly senior special—$76 for two players for 18 holes, cart and lunch. Andrew Lettrich, head professional and general manager at Glacier View Golf Course gave our readers some advice on golfing.